A couple of months ago, the DocumentDB team kicked off a friendly contest among Azure and SQL Server Microsoft Most Valuable Professionals (MVPs) to see who can do the most to foster, excite, and educate the DocumentDB community. We offered the participants 1:1 time and attention to help them deepen their knowledge of DocumentDB, and an open ear for sharing product feedback to help shape the future of DocumentDB. On November 3, 2015, during 2015 MVP Global Summit, the DocumentDB team held the inaugural DocumentDB MVP appreciation event for the winners of the contest. We would like to thank and congratulate the winners as they are the first generation of a new class of contributors, DocumentDB Wizards. DocumentDB doesn’t have an official MVP program unto itself, so the Wizard program is our way of recognizing individuals who have demonstrated their mastery of DocumentDB. So without further ado, here are the first DocumentDB Wizards! Pictured below: Leonard Lobel, @lennilobel; Allan Mitchell, @allanSQLIS; Mihail Mateev, @mihailmateev. Not pictured: Jen Stirrup, @jenstirrup. These four Wizards received a red Microsoft polo autographed by Scott Guthrie. During the event, the product team took the opportunity to share future feature considerations with the Wizards in addition to gathering valuable feedback on the product. Thanks again to the MVPs that have participated in the contest, we appreciate the time you put towards DocumentDB and the wealth of experience you bring to the table. And last, but not least, a special thanks to Scott Guthrie for his support of the contest. And don’t worry if you’re not an MVP, you can also get your questions answered by scheduling a 1:1 chat with the DocumentDB engineering team. 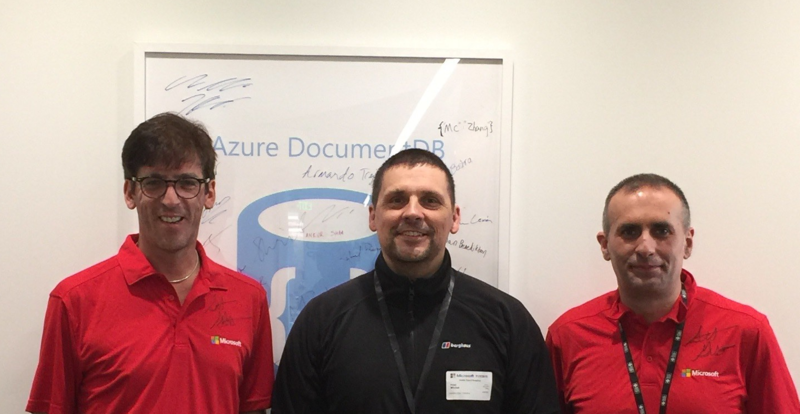 If you’re interested in becoming a DocumentDB wizard, send us an e-mail at askdocdb@microsoft.com to let us know. We’re always on the lookout for customer stories, open source projects, meet-ups, and courses to share on our community page.